St. Patrick’s Day has always been a special day for me. 23 years ago, my future wife visited me and we got to hang out over St. Patrick’s Day. Somehow I convinced her to move from her state and move to my town. Seriously.. I don’t have that kind of charm, but apparently, back in the day, I must have had some solid mojo. 2 years later we married! If you’re a musician living with a significant other, you know how important it is to have a supportive spouse. I’ve seen music break relationships over money and the need to share time. It can be tough. So when you have an ultra supportive wife, like I do, you need to acknowledge that. I strongly feel that the reason I still play music today is because of her support and encouragement. 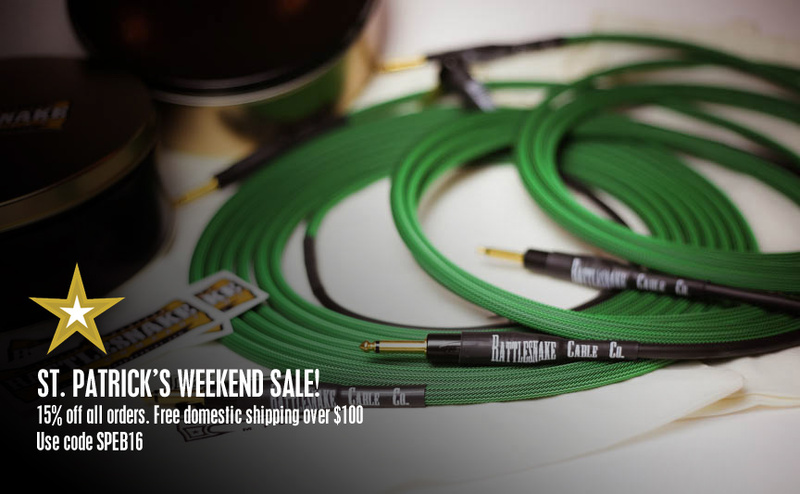 When I’m not nerding out on guitar gear, I focus on my other venture – Rattlesnake Cable Company. I thought I would put on a fun little sale over this St. Patrick’s Day Weekend with a sale. I’m knocking of 15% off all regular priced cables and including FREE domestic/US shipping on orders over $100. This sale will run until tomorrow night (Sunday) at 11:59PM MST.. so don’t miss out. To take advantage, visit the site and submit a build request and enter the following discount code: SPEB16. If you’re all good on cables, but know of a musicians that are in need, please let them know about the sale!